The windmill's labor is contingent upon the weather, upon what air masses, at any given time, overlie its landscape. Anticipatory in mood, Weather Eye Open adopts the emblem of the windmill, seeking what Merleau-Ponty calls the "inspiration and expiration of Being." The windmill serves as analogue to the perceiving subject, to the poet, whose consciousness, though rooted and partial, is yet always receptive to being energized, turned. Like open sails, the perceiver ushers the weather indoors, converting one motion, the wind, to another, the grinding burrstones. The poems in this collection pursue a similar transmutation through language, a staying open to its various weather (and whether) systems. For Sarah Gridley, language strikes at the "X" of experience: part presence and part absence, part spirit and part matter, part home and part homesickness, part harnessed and part wild. In the face of such weather, the stance of the poet is both rapacious and passive, searching and struck still. 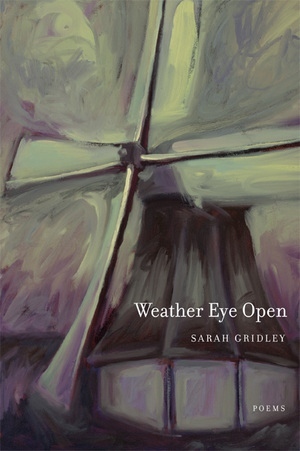 Sarah Gridley received an MFA from the University of Montana, where she was named the 1998 Richard Hugo scholar and won the 1999 Merrian Frontier award. Her poems have appeared in Jubilat and the Beloit Poetry Review.